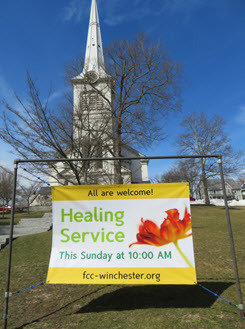 Many churches have active prayer shawl groups, fellowship events, and sick member visits, but First Congregational Church in Winchester has a Health and Wellness Program that focuses much of their efforts on the Christian traditions of healing, health sciences, and ministering to families and members across their life span. "We believe a vibrant life of faith is grounded in the well-being of body and psyche," said Kathleen Zagata, Health Minister. "And a faith community is an unparalleled source of better health." The church's Health and Wellness Ministry was formed to encourage all to deepen faith practices through mindfulness, healthy life style choices, and balance in work and personal life; to seek healing, comfort and guidance offered by faith at times of crisis, grief and stress; and to build a healthy community through fellowship, service and visitation. Different teams have formed in order to attend to the different needs. The Caring Network team reaches out with a meal or practical gift in times of acute illness, transition or unexpected event. A Visitation group bestows prayer shawls and gives communion while the Flower Committee connects with members at important life milestones. They offer prayer circles and laying on of hands to those who request them. Several times a year, eight or more congregants are paired with a minister or deacon after Sunday service to visit home-bound members and those at assisted living centers to share the good news preached at morning service and receive the joys and concerns of the person being visited. The Team also brings referrals to the Sounds of Grace, a Winchester-based interfaith hospice choir providing music for individuals in hospice and palliative care both at home or in a care residence. There are programs in place to strengthen the mental well-being of those in certain stages of life, including fellowship teas honoring elders and their families, college parent workshops, and organized stroller walks for infants, toddlers and their parents. In September 2016, a major initiative was launched in partnership with NAMI (National Alliance for Mental Health) to raise awareness and reduce stigma around mental illness. Seventy people from around the community viewed the film Pack Up Your Sorrow, a documentary about dealing with mental illness that centers around the personal story of singer-songwriter Meg Hutchinson. A panel discussion followed, aiming to pierce the silence associated with mental illness, replace fear with compassion and remove stigma as a barrier to full participation. Follow-up initiatives include healing services, family education and support offerings and networking with interfaith and community mental health groups. The Healing Ministry holds a service of light during Advent, which is aimed at helping those who experience a loss of joy during the holiday season, and helping to move them from darkness to hope by opening them to God's quiet presence. Each program year, the Health Ministry Committee selects one healing scripture for its monthly Bible Study, which becomes the foundation for the Lenten Health Ministry Healing Service, at which congregants are invited to a healing station for individual prayer and laying on of hands. Individual consults with the church's Health Minister Kathleen Zagata are available, regarding community resources, support with illness, mental health or addiction issues, and faith-based healing arts such as guided meditation prior to surgery or medical treatment. As a faith community nurse, she has witnessed how faith is essential to well being, and mastery of life's milestones as well as how it makes a difference in times of crisis, illness, and addiction. "Our Christian tradition makes clear that Jesus was not just about fixing a diseased person, his intent was to heal in God's name and to restore each person to fullness and community. Thus health ministry is based on a whole person model -- mind, body, emotion and spirit -- encouraging us to become the person God is calling us to be at each developmental stage," she explained. For this season's Lenten program, the church invited the members to adopt a health-promoting habit for forty days. Members could choose their own personal lifestyle practice -- mind, body or spirit -- which fosters greater wellness. Some suggestions were fasting 3-4 hours before bedtime until breakfast to allow the body to detox; centering through prayer, meditation or movement such as yoga to reduce cortisol and insulin spikes; and creating a gratitude journal to cultivate an attitude of gratefulness. "Lent is the season we recall the forty days and nights Jesus spent fasting in the desert prior to beginning his public ministry," Zagata said. "The season also lends itself to a time for our self-improvement. A forty day mindfulness practice reinforces commitment to change." "I look forward to the connection I can draw between my Lenten practice and Jesus' deprivation," said The Rev. Judy Arnold, a member of the Ministry Team. "My prayer for the whole congregation is that we embrace a Lenten practice -- either from the Health Ministries' list or our own -- that widens our hearts and deepens our love." Zagata encourages all to enhance their faith by living the connection between wellness and spirituality, both personally and in ministry to others. She is open to providing a graduate internship in Faith Community Nursing. Kathleen can be reached at extension 106 at the church office at (781) 729-9180 or email at info@fcc-winchester.org, or visit their Facebook page. For additional resources, visit the Ministries of Health section of the Rhode Island Conference United Church of Christ.